Measured from the base of the hydroelectric turbine, to the ceiling of the glassblowing workshop on the floor above, Tropical Storm Irene’s floodwaters were about 50 feet deep in the old mill that houses Simon Pearce’s Quechee business. The company is world famous for its high-end glass products, and a popular Vermont destination. This month, for the first time since the flood the glassmaking operation, restaurant and retail shop were all back in full operation. The workshop oven was full of molten glass when it was swamped by the rising waters of the Ottaquechee River last August. 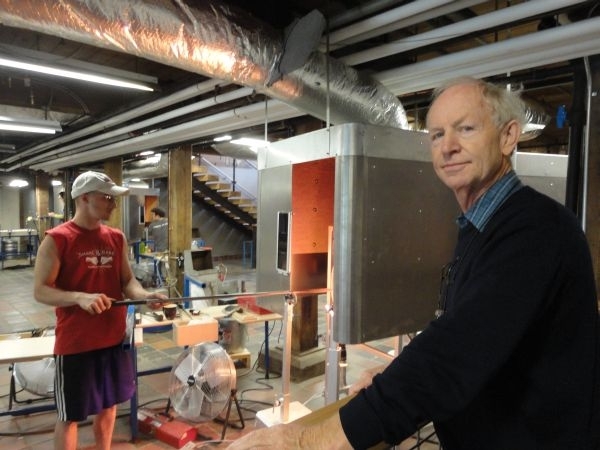 Now a new oven casts a brilliant orange glow into a new workshop owner Simon Pearce says is a better fit to the quarter million or more visitors who come here every year. "So when you come down to the glass blowing now, it feels much bigger," Pearce explains, adding that for the first time the workshop is also handicapped accessible. Pearce started his business in Quechee in 1981. "When I bought the mill, I found some old photographs of the 1927 flood," he explains. "Based on those photographs this mill didn’t flood. That’s when I put the glass blowing down here, based on the photographs of that flood." 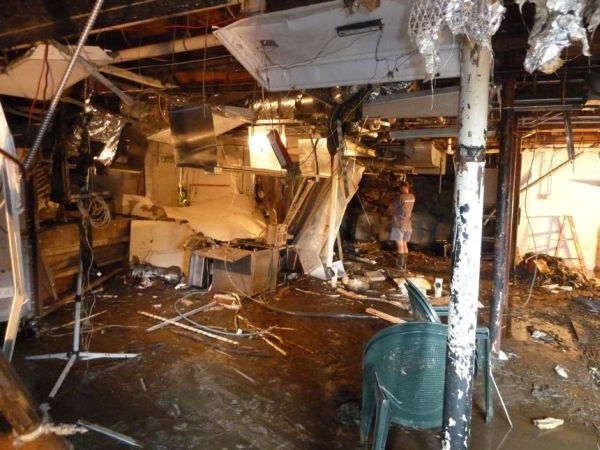 Irene spared Pearce’s restaurant and retail shop, but destroyed the glassblowing workshop and the nearby kitchen. It took six weeks for the business to reopen on a limited basis. None of the employees missed a paycheck because they were hired to do the cleanup. Simon Pearce employs about 150 people at its Quechee and Windsor locations. A second shift was added at Windsor glass blowing operation to make up for the production shortfall after Irene flooded the Quechee workshop. An increase in Web based retail sales in recent years helped cushion some of the blow, but Pearce says the company lost the revenue it would have made from visitors during the lucrative fall season. Another casualty of Irene was the mill’s hydro powered turbine. More than a showpiece, the turbine generates all the electricity the mill needs, which is about 1 ½ million kilowatt hours a year. By comparison, the average Vermont house uses less than 1/200th of that in a year. The cost of repairing the turbine is part of the estimated $2 million in damage at the Queechee business. Pearce took out an SBA loan to pay for it. Pearce says he feels fortunate compared to the personal losses suffered in Irene. And there’s something else that gives Pearce some perspective. Less than a year and a half before Irene, Pearce’s son Kevin suffered a traumatic brain injury in the Olympic snowboard trials in Utah. When Simon Pearce and his family arrived at Kevin’s bedside, doctors weren’t sure he would survive. "People said to me, ‘why didn’t you react more to the flood? Why weren’t you more devastated’,"Pearce says. "After seeing Kevin in that bed, the flood was a minor detail for us." Kevin Pearce has been slowly recovering from his accident. He lives independently now last winter he got back on a snowboard. Vermont officials say some hard-to-reach parts of the state will soon have cell phone coverage thanks to the successful test of a new system.